Josh Groban looked so handsome while stepping out for the premiere of his new show The Good Cop! The 37-year-old entertainer hit the red carpet at the event on Friday night (September 21) at AMC 34th Street in New York City. 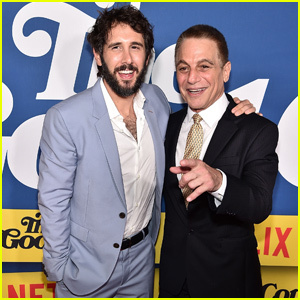 Josh was joined by his co-stars Tony Danza, Isiah Whitlock Jr, Monica Barbaro and Bill Kottkamp. The new Netflix series follows a disgraced NYPD officer who just got out of prison and begins to work with his son, an earnest, obsessively honest NYPD detective. The Good Cop is now available to stream. Sophia Bush Reps Her 'Chicago P.D' Pride at 'One Chicago Day' Event! Sophia Bush rocks a bright yellow jacket while attending the One Chicago Day event held at Lagunitas Brewing Company on Monday (October 24) in Chicago, Ill. The 34-year-old actress was joined by her Chicago P.D. co-stars Jon Seda and Jesse Lee Soffer. The event was held to celebrate NBC’s four Chicago-based TV shows – Chicago P.D., Chicago Fire, Chicago Med, and the upcoming series Chicago Justice. It included pumpkins carved with the series’ names and a real Chicago firefighting demonstration! Other cast members from the shows who were in attendance included Marina Squerciati, LaRoyce Hawkins, Kara Killmer, Carl Weathers, Torrey Devitto, Christian Stolte, Taylor Kinney, Joelle Carter, Yaya DaCosta, Colin Donnell, Eamonn Walker, Oliver Platt, Rachel DiPillo, Philip Winchester, Monica Barbaro, and Nick Gehlfuss. “Sister smooches, from our family to yours! #OneChicagoDay #SisterSister #Monphia #Mona #MonicaRaymund,” Sophia captioned an Instagram selfie she took on the red carpet with Chicago Fire star Monica Raymund (below).